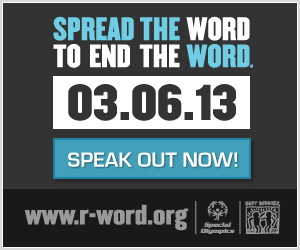 Today, March 6, is the annual day of awareness to end use of the R-word. It is pretty common among young people to use hurtful words, not always using them for their original meaning, but unthinking speech, even is just lazy and not meanly-intended, can be harmful. Be precise. Respect yourself enough to understand and get with the times. Take the pledge ad end the word.